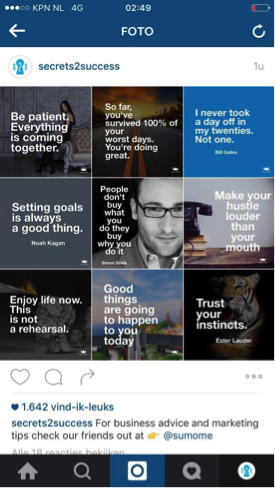 Here’s a recent article I posted at the Huffington Post on the 5 proven steps to making money on Instagram. Imagine a 24 year old in the Netherlands making a six-figure yearly income working only 4 hours per day. Imagine a 15 year old in New Zealand making $40,000 per year working 2 hours per day while going to high school. Imagine a 20 year old in Canada growing 5 accounts to 250k+ followers within 6 months and selling one of them for $25,000. Believe it. The list of successful millennials goes on and on! Having spent the past month conversing with numerous successful young entrepreneurs on the strategies they are deploying to make money on Instagram, I have gained an insiders perspective, which I am excited to share. A caption shoutout is when your account mentions another accounts name in the caption section of a post. The good part about these is that you control the image, so it doesn’t dilute your account or your brand with other people’s imagery. The best placement for these is at the top of the caption, so they are clearly visible to your followers, without having to scroll down. 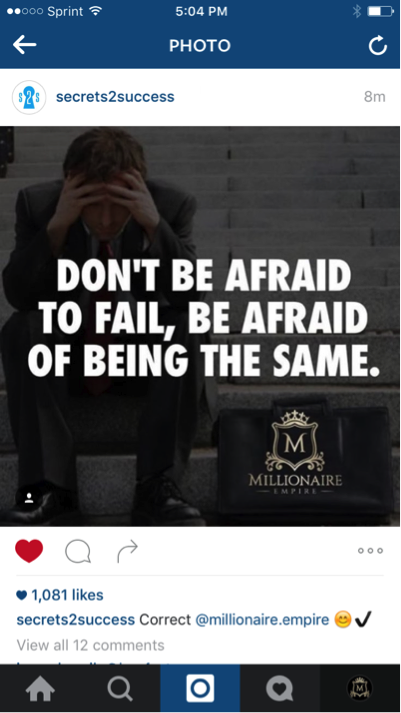 Here’s an example of @millionaire.empire (62k followers) giving a shoutout to @secrets2success. Here’s an example of @secrets2success (934k followers) giving @millionaire.empire a shoutout, which had 10,512 likes within 9 hours. This combines the former caption shoutout but now adds an image that the other account gets to choose for you to display. A high quality image that matches the quote or caption can lead to growing many new followers. This is a great opportunity for companies to promote their products, and an opportunity for you to upcharge for it being a corporate product. Towards that end, there are some accounts who can fetch thousands of dollars for 1 single post of a company’s product; all the more reason to be a social media influencer! 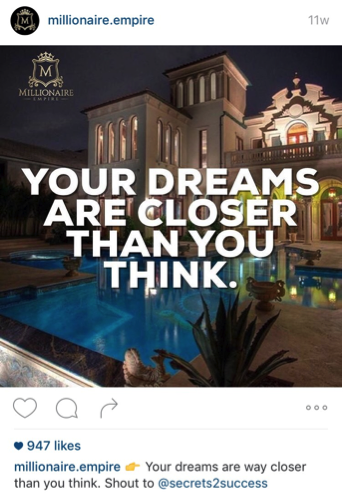 Here is an example of @secrets2success providing a caption/photo for @millionaire.empire, which reached 1,081 likes within 8 minutes, and contributed to hundreds of new followers. A screener is ultimately a snapshot of an account that is shared with your audience. The importance of a screener is that it is a visual display of that accounts imagery. If the images are clean, writing is crisp and the account summary is appealing, this can draw in many new followers. In the summary/bio section of each account is room for 1 clickable domain url link. This is prime real estate, especially for businesses selling a product or people who are selling something such as an eBook. Here is an example, where @secrets2success has set up a clickable link to purchase a book called “The Marketing Blueprint”. This book has already sold over 15,000 copies. Here is where you use the power of your massive following to set up affiliate deals with people who want to push an ebook or market a service. You package up a bio link and a series of photo/caption shout outs, or whatever it takes to promote it, all the while earning a 50-80% commission. You operate an account with 350,000 followers and 3% engagement. You post 5 times per day for 30 days. Each day consists of 1 product promotion of $50 x 30 = $1500, 3 shoutouts at $30 x 30 = $2700, 1 caption/photo at $50 x 30 = $1500 = $5700. Next, add in the domain link of $250/week x 4 weeks = $1000. Total = $6700/month. While it sounds relatively easy to make money, it is not. It is a game of hustle and attraction! Those that play, and are successful can also tell you about the 12-16 hours they spent every single day, month after month, building their audience. What are their key components? Engagement is the name of the game for social media. 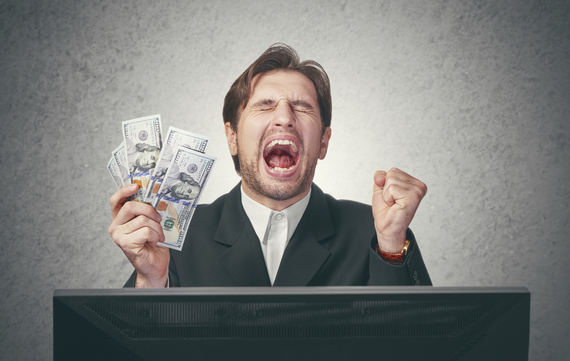 As engagement increases, so does your earning potential. Customers want to ensure that the advertising money they are spending on your page is going to contribute to their own pages having a strong engagement, once those followers start following them. Engagement is defined by # of likes / total followers. You can also measure it as a hybrid of # of likes + # of comments. An account with 50,000 followers and 3% engagement is much better than an account with 100,000 followers and 1% engagement. 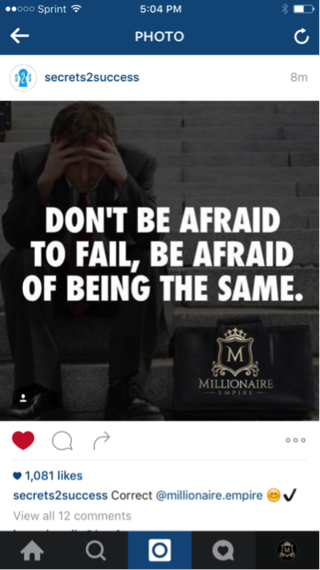 Small accounts are always looking to springboard themselves to success by attracting a large following. Who doesn’t love the thought of spending a few bucks to bring you a new audience of a few hundred new followers? The reason these accounts are so successful is because those that are paying them are seeing the returns. The most successful post I’ve heard of is a motivation/luxury account that gained 6k new followers from 1 caption/photo shout out, from an account with 750,000 followers. First impressions matter. Studies have shown that it takes less than a second for an online visitor to form an impression of you or your brand. These accounts know what “reels” people in and they keep it specifically focused on what value they deliver to their audience. 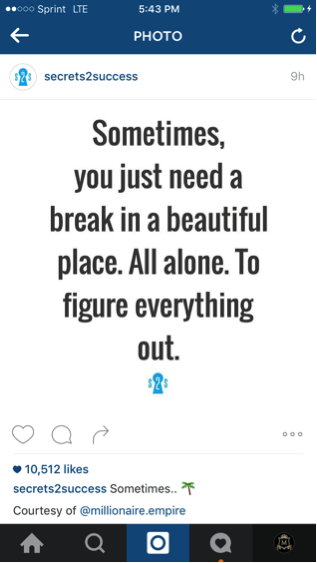 Want more Instagram tips? 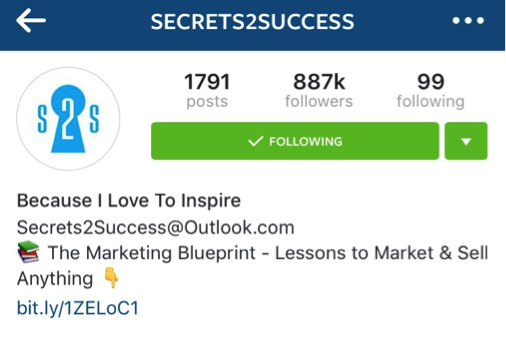 Our friends @secrets2success are about to release a new book, which will outline their 17 secrets to Instagram success while reaching the monumental 1 million followers. Stay tuned! A special note that Instagram, owned by Facebook does not support solicitation of any kind on their platform, so be warned that you could lose your account. Copyright to all respective owners used in this post.